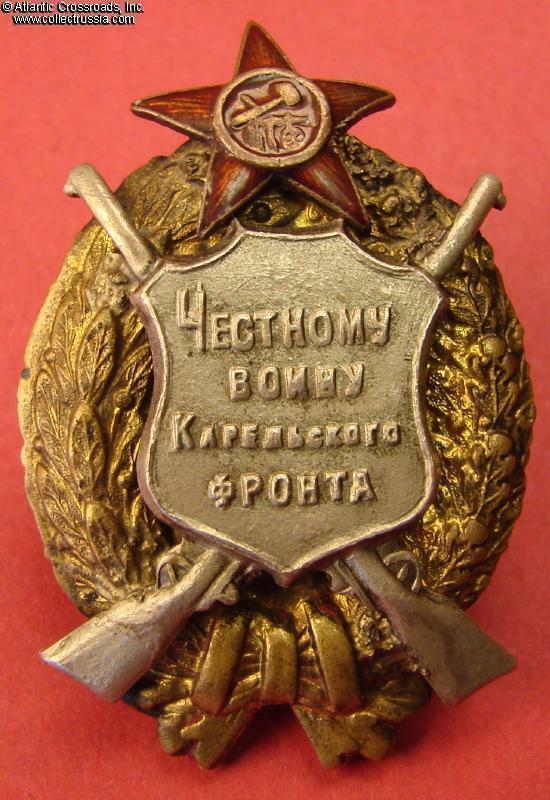 Badge to an Honest Warrior of the Karelian Front, 1922. Brass gilt, silver plating, "cold" enamel; measures 55.2 mm in overall height, approx. 46.5 mm height of the oval portion; 37.2 mm in width. Three-piece construction: the silver shield with crossed rifles and the star are separate, superimposed parts. 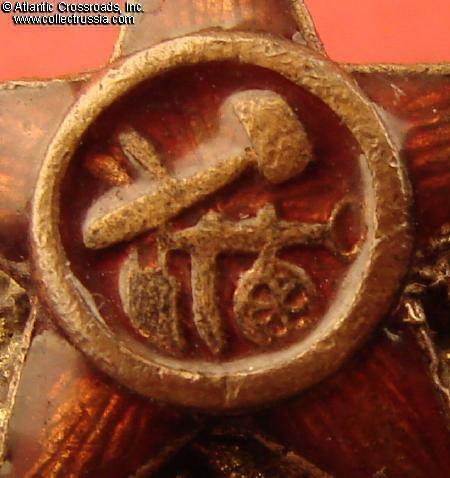 The Red Army star insignia is of the early type, with the hammer and plow emblem rather than the later, far more familiar hammer & sickle. 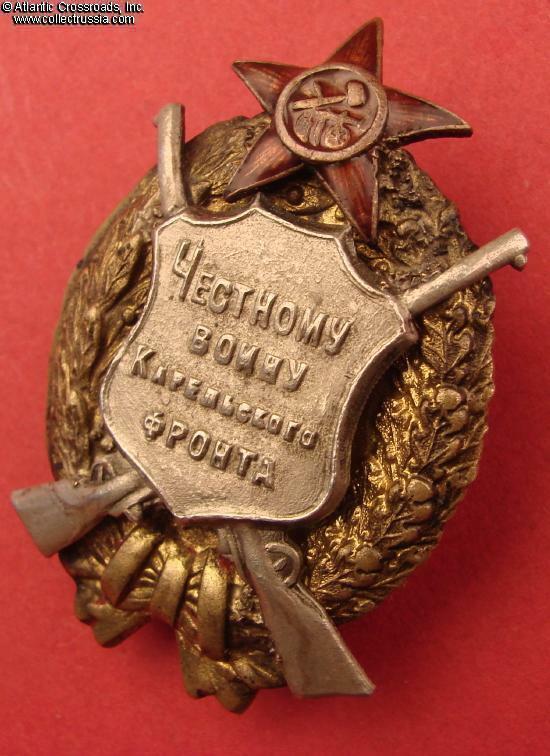 This version of the badge features the shield with the correct spelling "Karelskogo" ("Карельского") as opposed to the old fashion "Karelskago" that appears on the other known type. 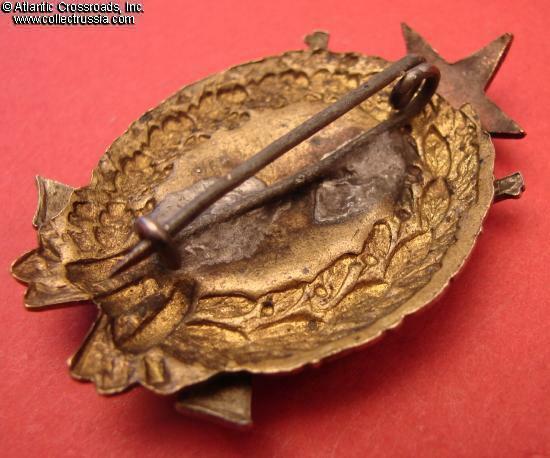 The star at the top was replaced at some point, apparently long time ago, with a more substantial piece in solid copper with "cold" enamel (this was probably a customization by the recipient of the badge, who must have been unhappy with the quality of the original star in cheaply pained tin). 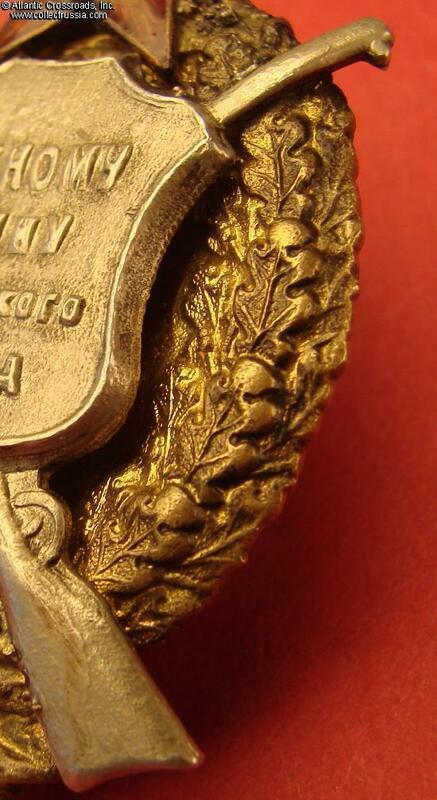 Other than the replaced star, the badge is in perfect condition: the original gold finish on the wreath is exceptionally well preserved and bright, the silver finish on the shield portion is likewise perfect. The parts of the badge fit tightly. The pin on the reverse appears to be of the period. 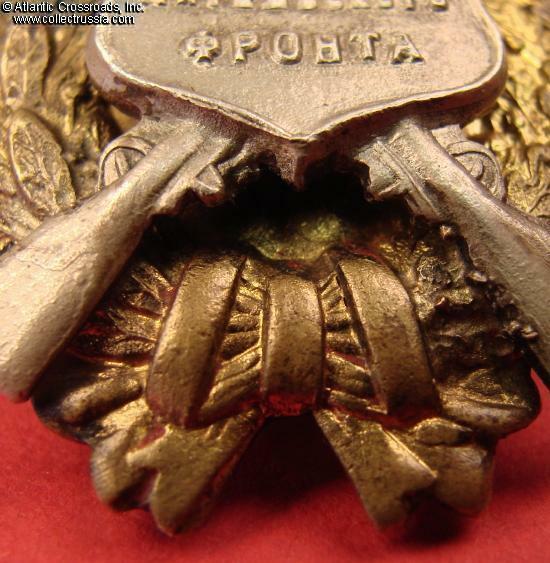 Overall, condition of this piece is outstanding for a Karelian Front badge: most other surviving original examples are either thoroughly corroded dug-up relics or have been completely restored. 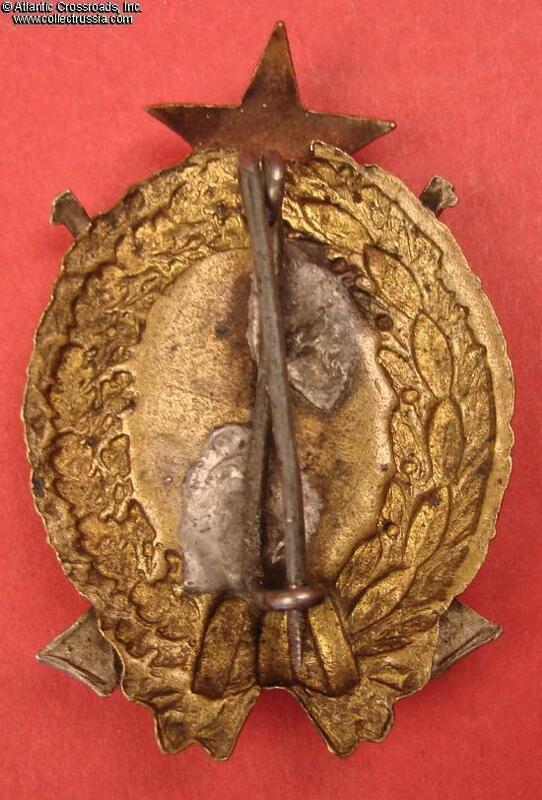 Although it is commonly referred to as a badge, this award originally had the status of a jetton. 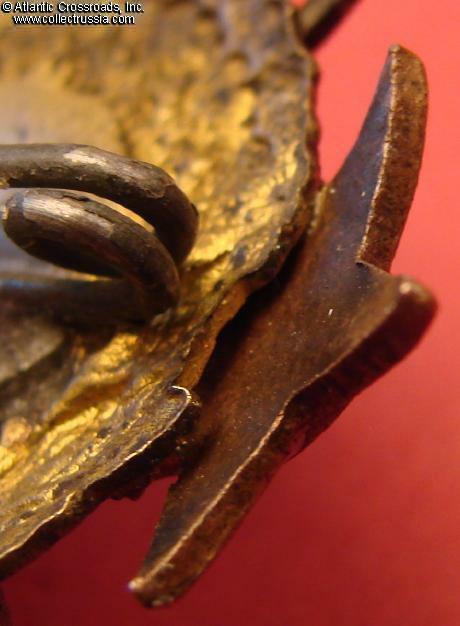 Hence it was apparently produced and issued without an attachment; a pin or, less often, a screw post were later custom added by the recipients at their own discretion. The Karelian campaign took place during the period of October 1921 - February 1922. In one of the final episodes of the Civil War, an anti-communist peasant rebellion flared up across Karelia and in the Murmansk region apparently aiming to secede from Soviet Russia. The Bolshevik government claimed an intervention by the neighboring "White Finns" and mobilized a punitive expedition numbering reportedly 8500 men under Kamenev, Gittis and others. In December 1921, the Red Army struck from three rallying points and by 17 February, crushed the "White" resistance and reached the national border of Finland. 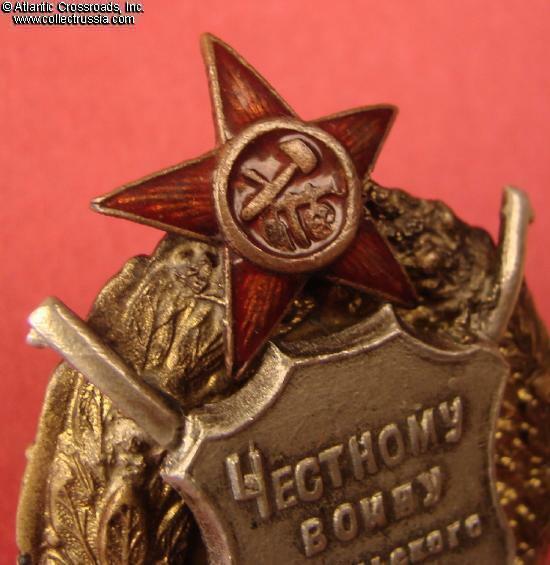 The Soviet participants of the battle were awarded with the jetton "Honest Warrior of the Karelian Front". Interestingly, there was no certificate provided with it although the award - essentially the first Soviet campaign medal - would be mentioned in the recipient's military ID and service record.